Fiddledeedee – Page 7 – My view of life from the linoleum. For Father’s Day, our church treated us with a little video about a daughter in search of the perfect Father’s Day gift for her dad. One year she gave him an M&M decorated tie, and another year he was surprised with a snow ski trip. His first time ever. Traction soon followed. Then one year his daughter wanted to surprise him with a deep sea fishing trip. Until her mother reminded her that her dad got sea sick. And what luck, there was even a flashback of him throwing up over the side of a boat on his honeymoon. This is when I was glad to have an aisle seat, because, well, you know what happens to me whenever vomit enters the fray. Finally, she found the perfect gift. A cake made of bacon. Smothered in chocolate. This gave me pause. I can appreciate a cake made of bacon. And I certainly have a deep abiding love of All Things Chocolate. But the thought of the two melded made me a bit queasy. The sermon went on and soon I forgot about the bacon. And the chocolate. Which meant that it was a pretty good sermon. At the end of the service, a picture of Kevin Bacon was flashed on the screen. I don’t really know what the text said, because all I could think about was bacon. And not the one with Kevin in front of it. It was announced from the pulpit that the dads would be given a piece of bacon smothered with Ghiradelli chocolate in the foyer in honor of Father’s Day. I had a flashback to a moment when we were engaged and had stopped at Carl’s Junior for a quick burger to go. We noticed long after exiting the establishment that my order had accidentally come with an order of fries. With a little spring in my step I uttered a small “yippie!” Knowing that I was intent on being able to fit into my wedding dress, Fiddledaddy thought he’d help me out by THROWING THE FRIES INTO THE TRASH. To say that I was mad was a bit of an understatement. I’m certain that if you know me at all, it should not come as a surprise to you that I AM NOT ABOVE GOING INTO THE DUMPSTER AFTER THE FRIES. Fiddledaddy saw a side to his almost-new bride that he had not witnessed before. I feared that the bacon could end up in the trash. And then I’d be forced to go in after it. And, because of the embarrassment and all (Fiddledaddy’s) we’d be church shopping and who needs that aggravation. I almost began crying it was so good. I eyed the leftover 1/3 of a piece in his hand. He declared that he was going to give it to his eldest daughter. I began explaining to him that I GAVE BIRTH TO HIS 3 CHILDREN. I may have frightened him a little. He was walking awfully fast. Trying to lose me I suppose. After collecting all of our children we found ourselves back down in the lobby. One of the pastors was walking around handing out chocolate covered bacon. TO THE MOMS. Finally. I abandoned my family to take an entire piece. MINE. ALL MINE. It was truly an amazing experience. For everyone involved. 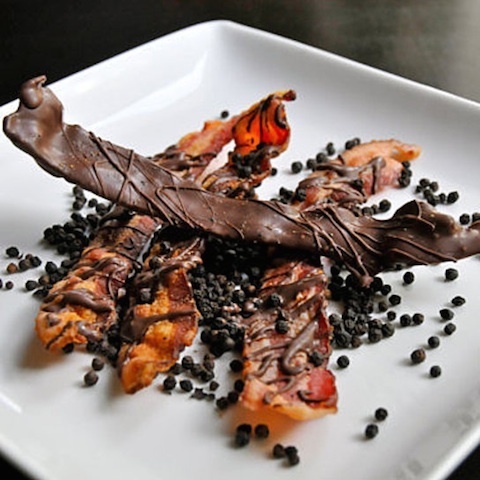 Bacon, chocolate, and me. A match made in heaven. Since Pinterest is my friend, I learned a few new tricks for our longer-than-usual camping extravaganza. My biggest concern was giving my family botulism from food gone bad on day 5 or 6. The whole “cooking 3 meals a day for 8 days for 5 people” weighed heavily on me. OH. And what luck! We had decided to all go Gluten Free a couple of weeks prior to camping. And by “we”, I mean Fiddledaddy, who happened to watch an episode of Dr. Oz on the benefits of gluten free living. In all honesty, though, as much as I avoid Dr. Oz, I am suppose to be GF because of my Lyme Disease, and I knew it would help Jensen’s Atopic Dermatitis. And then there’s the teenager and the tween and all the HORMONE SHIFTS. Perhaps, I reasoned, going GF would put us all on a level playing field. Anyhoo. I bought an Igloo 100 qt. cooler to hold everything, and began by freezing two one-gallon jugs of water. Then I pre-prepared one pot meals, and froze them flat in gallon freezer bags, taking care to label what they were and what day they would be used. I also have a small Coleman Camping refrigerator that I can plug in, for the dairy products and stuff we need to pull out fairly often. 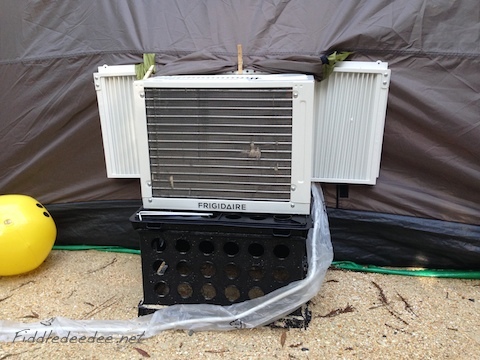 This is cheating in the world of camping. But I don’t care. I added sides to my 10×10 sunshade to make a kitchen. This came in handy because it RAINED for most of the first 3 days of the trip. The closet shelf doo-dad was my own personal brainstorm, and gave me a pantry of sorts. I found it at Goodwill, and just tied a heavy cord through the top to attach it to the metal frame of the Shade. And yes, I brought my pink rubber gloves for dish washing. Which brings me to another addition to my camp. 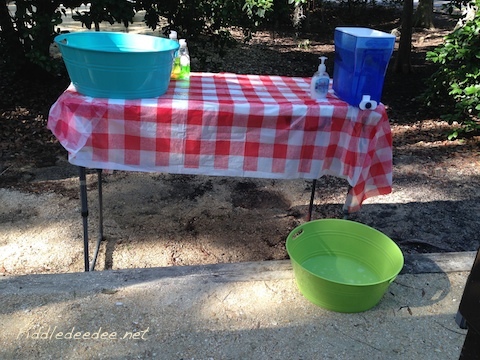 I used one of my 2 adjustable folding tables to create a hand/dishwashing station. I bought the two tubs at WalMart, and they were the perfect size for washing dishes and pans. The water filter container was another Goodwill find, and I just used the hose to keep it full so that we could wash our hands often with real soap. I used my green rinsing tub to catch the hand washing water. This set-up I could just leave out in the open. 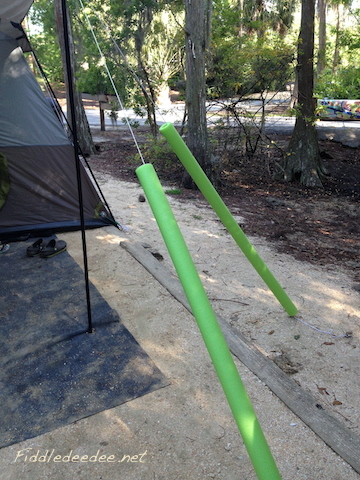 Another Pinterest idea was the use of pool noodles to keep all the children from decapitating themselves whenever they ran through the camp. This picture was taken after the monsoon like rains we received. You can see that my new porch rug took the brunt of the abuse. But we hung it over a fence and it dried quickly. 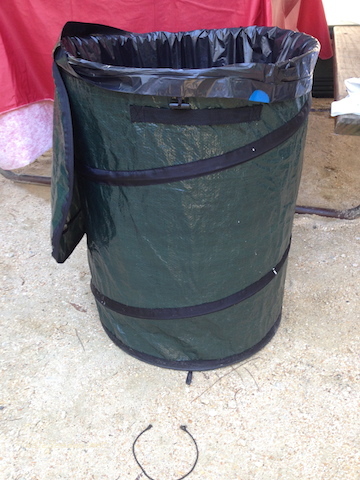 I also purchased from Amazon, a collapsable camping trash receptacle which zipped up whenever we weren’t around, in an effort to keep vermin out of the trash. I found evidence of a squirrel attempting to tunnel its way into my soft sided over the shoulder cooler to get at the Smores ingredients. The chocolate was spared, so I didn’t have to kill the squirrel in retaliation. This is where I lose all credibility as a camper. My husband insisted on purchasing an air conditioner. 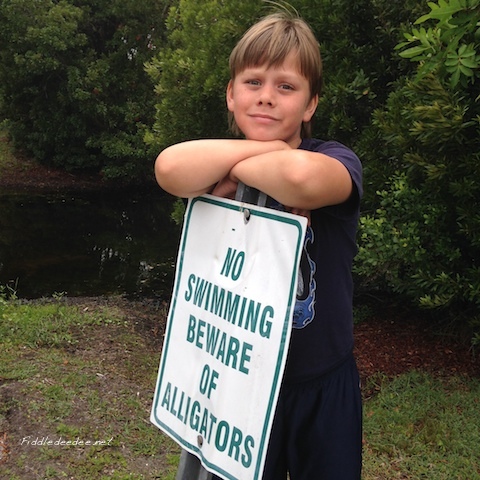 He reasoned that well, we do live in Florida. 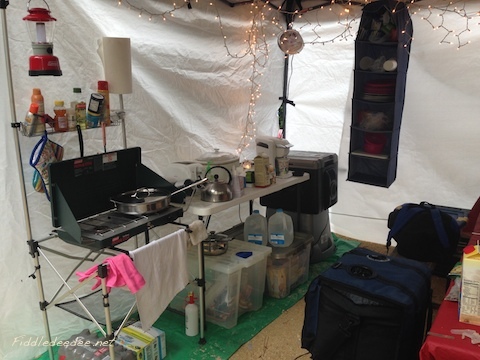 And the tent did come with an opening for such an appliance. I have to say that what with my hot flashes, and the humidity after a long rain, I did appreciate his sentiment. So did our friends who joined us in our air conditioned tent while the 6 children sweated it out playing card games in the not-air-conditioned tent during a rain storm. My only regret was not packing the sleeping bags and our small heater. The night time temperatures were suppose to be in the 60’s, but I grossly underestimated the cold night air in a tent. There were two nights which I dreamed I was freezing to death. Because I was. Fiddledaddy took one for the team and drove the hour plus back home to retrieve the heater, sleeping bags, and extra chocolate. Some of you seasoned campers, who hike 10 miles into the wilderness with nothing but a backpack and shovel are chuckling under your breath. I can hear you. I won’t lie, our kind of camping takes some well thought out prep and packing, but it’s well worth the effort. This non-camping type managed to keep her family alive for 8 days. The payoff? Spending awesome outdoor time with dear friends, while watching all of our children frolic through the trees, play games, and spend quality time away from all technology. 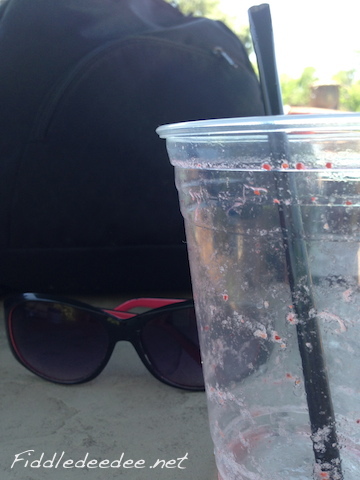 And the $8.00 poolside Strawberry Frozen Cocktail Concoction? Totally worth it. The months of April and May have been traveling months for the family Fiddle. One of our adventures involved a 7 night/ 8 day camping trip to Fort Wilderness at Disney World. Our longest camping experience to date had been 3 or 4 nights, so we threw caution to the wind and doubled down. The memorable experiences were numerable. And will be forthcoming, as my personal blogging exile as hopefully come to an end. As per usual, camping is an opportunity for Jensen to hunt and capture wildlife, particularly lizards. From sun up to sun down. In lieu of a proper lizard habitat, Jensen turns the provided Disney camp grill which each site comes equipped with, into a lizard jail. I always feel that I should leave a note of apology on each grill whenever we vacate a site. Because people, you know, actually cook FOOD on grills. On our day of arrival, while the rest of his family slaved over the camp set-up, Jensen caught his first lizard, which he promptly named George. He marched around the camping loop introducing George to anyone who even looked remotely interested. After George was properly shown off, Jensen made a home for him in the grill. The next morning, much to everyone’s surprise/chagrin, George was still there. Jensen took this as a sign that George loved Jensen as much as Jensen loved George. The morning progressed. Then as we were sitting around eating a leisurely lunch, Cailey noticed, “Oh my gosh, look Jensen! A bird just ate your lizard!” Jensen jumped out of his camping chair in time to see a large blackbird fly up into a tree with George in his beak. The bird complied, and dropped George at Jensen’s feet. Well. Parts of George. And not necessarily the best parts. Jensen stood staring down at the pieces of his former friend. Sobbing. Then after a suitable time of loud mourning and gnashing of teeth, say, 10 to 15 minutes, he looked back up at the bird, who sat watching the spectacle from the safety of a high branch, threatening to commit murder. I’m pretty sure that by this time Disney Parks and Wildlife security had stationed extra patrols in our camping loop. Eventually Jensen moved on to other local lizard life, and then “David” took up residence in the grill. Which Jensen had rendered bird proof. Later that night I visited the community bathroom (cleaner than my own, I might add) and while I was in my own personal stall, I overheard two women chuckling about a little boy they had met earlier and how he was walking up to little girls to see if they wanted to hold a lizard named George. From the sanctity of my stall, I told them that the lizard whisperer in question was my son, and then I told them of George’s untimely demise. In gruesome detail. There was a respectful moment of silence. And then I was left alone in the bathroom. Rest in pieces, George. You were a good and faithful temporary pet. I am the husband of the lady who writes this blog. I have decided to write today’s entry to honor her existence. Hang on. She shops at dawn. When only fearsome warriors venture from their dens. The few, the strong, the proud; The Coupon-Shoppers. Most of the Checkers scatter and hide when the Coupon-Shoppers descend upon their store, because the Coupon Shoppers know the rule about “competitors’ coupons!” And for the love…. they bring their own bags! Clipping and organizing coupons and strategizing BOGOS, she actually has two Sunday papers delivered each week to cull the cost saving tickets-of-savings. She creates chef-worthy meals that are often created around special dietary needs as her family experiments with a quarterly change in la carte du jour. She educates the three children whom she lovingly carried, then birthed and nursed in excruciating pain. And by educate, I mean, she painstakingly researches the best curriculum for each of their idiosyncratic learning styles, purchases each of these unique curriculums with our own hard earned money, and daily brings the joys of learning to new levels of awesomeness. And when one or more of the little darlings shows resistance to that day’s nuggets of newness, she perseveres with an assortment of tricks up her sleeve, including bribery (“reward-based learning”) or consequences, (“dinosaur extinction”). You would think that after surviving that day’s regurgitation of knowledge she would sit on the couch and eat bon bons. Not yet. She has to grade papers, wade through drawings of carnosaurs devouring herbivores and then diligently prepare for the next day’s excursion to knowledge. She manages the accounting of her various business pursuits as well as those of her husband, forcing herself to enter millions of numbers into small “fields” in the glowing box on her desk. All the while, she is beauty, she is love, she is patience and forgiveness. She is grace, she is mercy. After the excitement of the last couple of days as Fiddledaddy’s professional life intersected with William Shatner, you have to imagine that we would need to settle back down to reality. 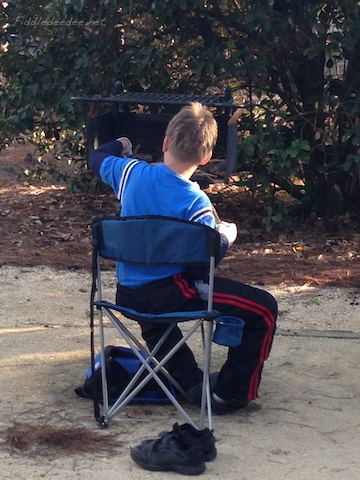 My reality is the rigors of homeschooling and parenting. Neither of which I’ve ever felt particularly prepared for. In fact, just yesterday I paused at the sink to rinse a glass. I looked out over the counter into the Family Room to see my 3 children all sitting quietly watching the same TV show. (It’s rare that they ever sit quietly, and together) But the show in question was Dr. Who, which is the only television show that they can all 3 stand to watch in unison. As I looked upon these 3 very different little beings, a thought struck me. I HAVE 3 CHILDREN. That revelation made me giggle. The children all looked up from their show to ask me why I was laughing. 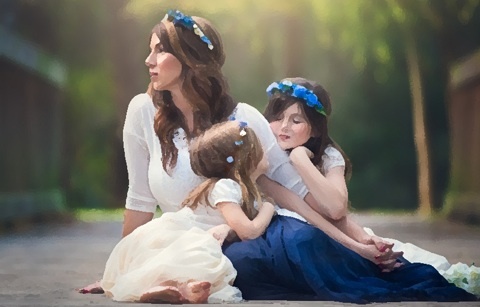 “BECAUSE I HAVE 3 CHILDREN!” They eyed one another, “Mom’s cracked.” Which is really not all that unusual this time of year. And then there was dinner. I had prepared a delightful gluten-free meal (thank you, Dr. Odd). Delightful to everyone save Jensen, who wanted nothing to do with the accompanying Cucumber/Tomato/Feta Salad extravaganza. But in order to enjoy the delicious gluten-free dinner roll that we used as bait at the edge of his plate, he had to endure the salad. The salad consumption took awhile. So Fiddledaddy and I planted ourselves close by on the couch. Cailey remained at the table to encourage Jensen. And by encourage, I mean BUG THE CR** OUT OF HIM, as she possesses a gene which leaves her no choice but to POLICE HER SIBLINGS. Then it happened. We heard an unassuming coughing sound. Followed by gagging. At which time Cailey fled the table to the far reaches of the house. Well played, little brother, well played. And just then he unleashed the salad back out onto his plate. Which still held the uneaten dinner roll. With lightning fast speed (not me, as vomit tends to immobilize my reflexes…not my gag reflex, that’s fully functioning, just my reflexes in general) the puke bucket was dispensed. And then another. He filled both. Two weeks worth of groceries. Just like that. As usual, Fiddledaddy took charge. The boy finished his excavation in the bathroom. Fiddledaddy left me in charge while he went outside to dispose of the contents of BOTH buckets. This was an error in judgement. Because as I was cleaning up the last bits of tomato spittle from the edge of the toilet, which looked strikingly like blood, the boy asked if he could go eat his dinner roll. He explained that it was on the EDGE of the plate and likely didn’t get all that splattered. My eyes rolled back and I went to my happy place. Which in this instance was the laundry room. Evidently Jensen went outside in search of his father (perhaps thinking that’s where the dinner roll disappeared to). When both reentered, Fiddledaddy couldn’t understand why I left my post of watching the boy TO DO LAUNDRY. It seemed perfectly reasonable to me. We all know what happens to me whenever vomit enters the fray. I’m just surprised that I was able to remain in the same state building. It’s always best, I think, to look for the bright side. Even if you have to dig extra extra deep. 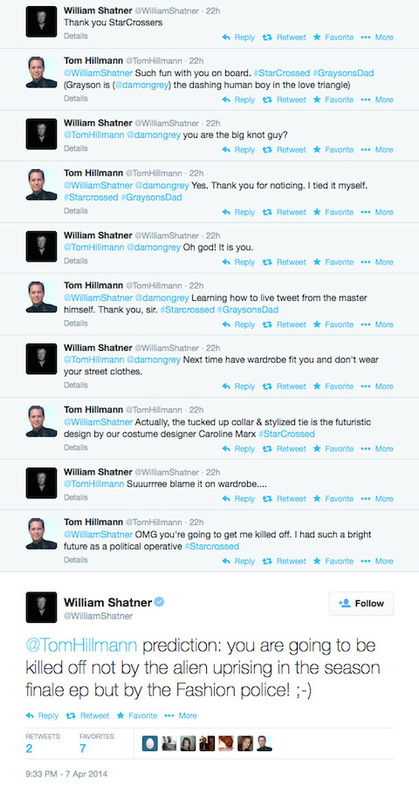 The tie-related banter between William Shatner, and the artist formerly known as Fiddledaddy, continued on today. 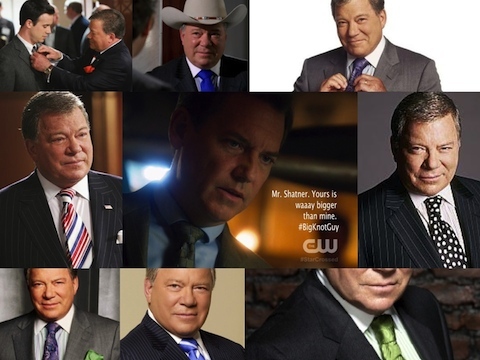 My husband, who also has talent as a graphic artist, put together this little collage for Mr. Shatner, which he posted on Twitter. Or Instagram. Or both. Several Twitterers, Twits, or whatever, came to my husband’s defense by posting fashion forward pictures of Mr. Shatner from the 70’s. A time when polyester ruled and everyone was highly flammable. Who doesn’t think the Leisure Suit should make a return fashion appearance? Said no one. Ever. Please know that this has all been in the name of good wholesome fun. Mr. Shatner is hilarious, and my husband is enjoying the roasting tremendously. It is also obvious that Mr. Shatner really is a fan of Star-Crossed and he even made mention that he would fight like H-E-double-toothpicks (H-E-double-toothpicks was not what he actually said, btw) to see Star-Crossed get picked up for a second season. He did, however, make a prediction that Mr. Montrose (Fiddledaddy) could be killed off by the fashionista police. He always leaves a 😉 after one of his barbs. When a fan made mention “nice collage,” Mr. Shatner shot back something to the effect “and if this show doesn’t work out, he could get a job in, say, decoupage.” Awesome. This is an actual conversation that I had with Fiddledaddy last night. William. 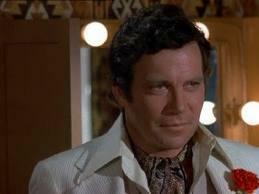 Shatner. Captain James T. Kirk. Of the Starship Enterprise. Sometimes things are said in the context of married life that you would have never ever envisioned yourself hearing from your spouse. There is an explanation. Of sorts. Fiddledaddy is an actor. He plays Mr. Montrose on the new CW show, Star-Crossed. One of the best ways to gain popularity for a new show, in this day and age, is through social media. Therefore, the cast of Star-Crossed often live tweet during the airing of the show. In other words, many of them have Twitter accounts, and while the show is live, they Tweet using the hashtag #StarCrossed. Thereby, anyone using this hashtag can see what everyone else is saying about the show. Including the cast members. This engages the fans and creates a media buzz. A good-natured trading of barbs between my husband and CAPTAIN JAMES T. KIRK ensued. Life. It is weird. Beam me up, Scottie.